The night before last, I fancied watching a horror movie. It didn’t matter if I had seen the film before, I just wanted to escape into a tale from one of my favourite genres of cinema. So far, so ghould? I ended up scrolling and scrolling through lists and more lists of horror films on both Amazon and Netflix until it all got a bit late and I decided to read my book (Stephen King’s Pet Sematary, in case you were interested) instead. Has that ever happened to you… I think it has happened to everyone, right? This is today’s equivalent to pacing up and down, up and down the aisles of Blockbuster in search for the perfect film that will match your mood. As a result of this pretty frustrating experience, I have decided to make a list of ten brilliant horror films available (at the time of writing) on Amazon Prime Video. I have seen them all before but I could happily watch any of these movies again… and (for most of them) again. Ari Aster’s debut feature is a shocking and devastating ride into horror and despair, anchored by a simply phenomenal performance from Toni Collette. Following the tragic death of her husband, Amelia is left to bring up her extremely demanding son, Samuel. She is absolutely exhausted as, plagued by nightmares, Samuel keeps her awake - every night. Stretched to breaking point, she still makes time to read to Samuel every night. One night, they find a new pop up book. Amelia starts to read - only realising just how dark and scary the story is midway through. By then, however, it is too late and mother and son begin to be terrorised by the book's main character - The Babadook. Jennifer Kent’s brilliant film is a terrifying portrait of grief and guilt. The Borderlands is a found footage horror gem. Given the franchise it spawned, it seems incredible to recall that Oren Peli’s Blair Witch-esque found footage film was made for just $15,000, over the course of seven days in the director’s own home. This movie taps into our primal fear of what goes on when our backs are turned and the lights are out. While we may be over the found footage format, Paranormal Activity remains as scary as ever. In 2013, a camera crew was allowed access to a highly secret and extremely dangerous society. The crew followed a group of New Zealand based vampires who share a house together. The filmmakers also interviewed them about their daily routines. After his last assignment goes horribly wrong, hitman Jay (Neil Maskall) decides to give up his ‘day job’. However, he has bills to pay, a family to support and he is under great pressure to return to his lucrative, if unpleasant, profession. A disastrous dinner party reunites Jay with former colleague, Gal (Michael Smiley), and tempts him to agree to one more job. At first, the task at hand seems simple enough for the killers. However, it soon becomes dark, full of foreboding and fraught with danger. Kill List is a tense and horrifying genre twisting tale - with a killer of a third act. Rebecca (Teresa Palmer) left home at an early age, desperate to escape her childhood fear of the dark and a mother (Maria Bello) struggling with mental illness. However, when Rebecca sees her little brother, Martin (Gabriel Bateman), experiencing the same trauma, she knows that she must return home and face the darkness - and the terror that lies within. The concept for Lights Out is undeniably effective and delicious. Add solid performances from an impressive cast (Palmer and Bello are particularly powerful), a director who understands tension and suspense and a backstory with surprising depth and the result is an effective and entertaining a horror movie. Florence Cathcart (Rebecca Hall) doesn’t believe in ghosts. She only seeks the truth. Indeed, she has made a successful career out of exposing those who, in the aftermath of World War One, would seek to exploit the grief of others by creating phony supernatural events. Her line of work is exhausting and so she is reluctant to take on a new case - the ghost of a child believed murdered in a building that now houses a boarding school for young boys. Is Florence up to the challenge? Will she find who or what is responsible for creating terror among the boys? I really enjoy The Awakening. It is not the scariest ghost story that I have ever watched but, largely thanks to a brilliant performance from Rebecca Hall, it is a very enjoyable chiller. When a zombie virus breaks out in South Korea, Seok-woo (Yoo Gong) and his young daughter Soo-an (Soo-an Kim) find themselves in a desperate fight for survival aboard a train from Seoul to Busan. I adore Train To Busan - it really is a gripping zombie film and one with a very big heart. 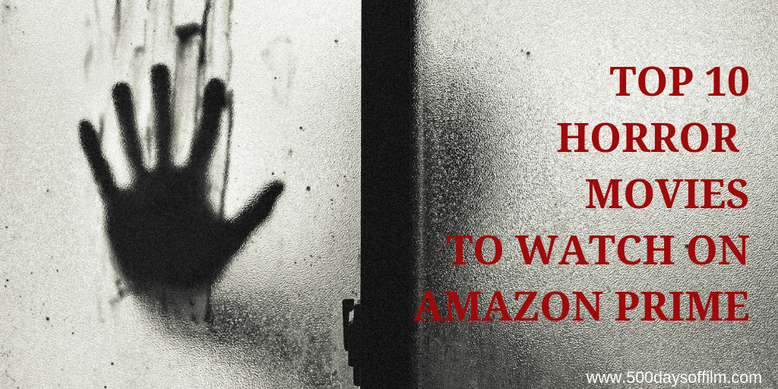 What do you think of my list of ten horror movies on Amazon Prime Video? What would you add? Honourable mentions for me include Eden Lake, The Hole (directed by Joe Dante) and I am intrigued by 5-Headed Shark… you can’t survive the five! Let me know what you think of these films or what you would add to the list in the comments section below or over on Twitter. You can find me @500DaysOfFilm. Like that lot except for the last one . Do not like Zombie films . I like Awakening because of Rebecca Hall’s performance I think. Lights Out is fun! Let me know what you think when you get a chance to watch them! I’m loving Pet Sematary. I read it some years ago and had forgotten how good it is... so unsettling and full of dread. V excited for the new film adaption!